We stock phosphate buckles for woven strapping, the phosphate surfaces allows the buckles to grip the woven strapping, offering maximum retention on the strapping. 16mm HD Phosphate Buckles 3.5mm Our 16mm HD Phosphate buckles are made in Germany from 3.5mm thick wire and for use with woven strapping. 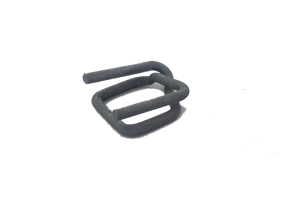 19mm HD Phosphate Buckles 4mm (1000) Our 19mm HD Phosphate buckles are made in Germany from 4mm thick wire and for use with woven strapping.